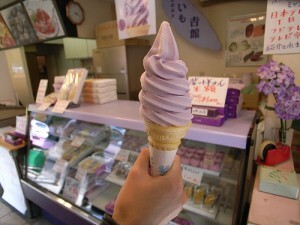 Different towns of Japan serve their unique soft served ice creams flavored with something that the town features. 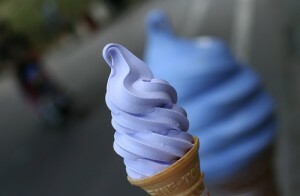 For example, the Kurihama Hana no Kuni Park in Yokosuka, [W:Kanagawa Prefecture] has lavender flavored ice cream. It tastes vanilla but it smells lavender of course. Actually, some other garden parks have lavender ice creams too. This purple one is murasaki-imo (naturally purple sweet potato) flavored from Kamakura12/7. The ice cream tastes light and it’s kind of textured like sweet potato. 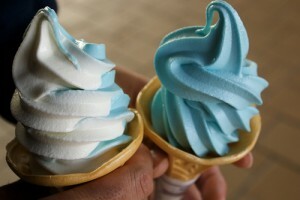 The next one is blue rose ice cream from the Echigo Hillside Park in Nagaoka, [W:Nigata Prefecture]. 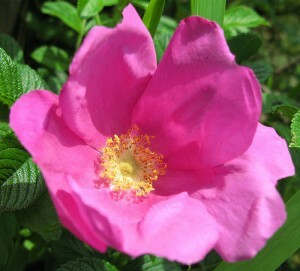 It’s said it actually tastes like rose. 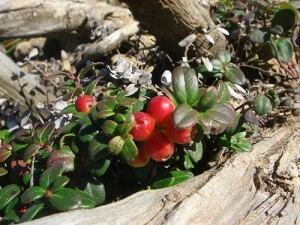 The last one is kokemomo (lingonberry, also called cowberry) and rosa rugosa (Japanese rose) flavored ice cream from Shiretoko Five Lakes. 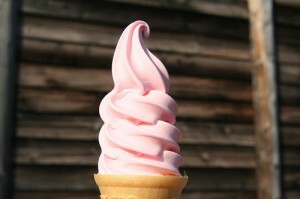 It’s said the ice cream is refreshing with mild sweetness. These are only a few examples but there are many original flavored ice creams sold different parts of Japan, and visitors make line to get them! Is there unique soft served ice cream in your country too? ?